as i’m sure you are aware, i haven’t updated in a very long time. it’s not because there hasn’t been anything to write about. quite the contrary, we have been so busy, that i just haven’t been able to find the time – or i should say make time to write. i’m thankful that so many folks have continued to read the blog and more folks have subscribed, despite such a lengthly absence from posting. in a previous post i gave a big update on all the lead remediation work we had done, the only major task left to do for this year was the kitchen. with one last big push s and i encapsulated all the woodwork and then painted over it with a basic white – two layers of encapsulant, and two of the final color for the wood work, and two coats of primer and two of final color for the walls. it took a very long time. having the kitchen pulled apart was a pain, we spend a huge amount of our day in the kitchen and having it not easy to use certainly put a crimp in our style. we ate a good amount of take out. i’m happy with the result. the new color is much brighter than the old. we still have much to do in the kitchen. 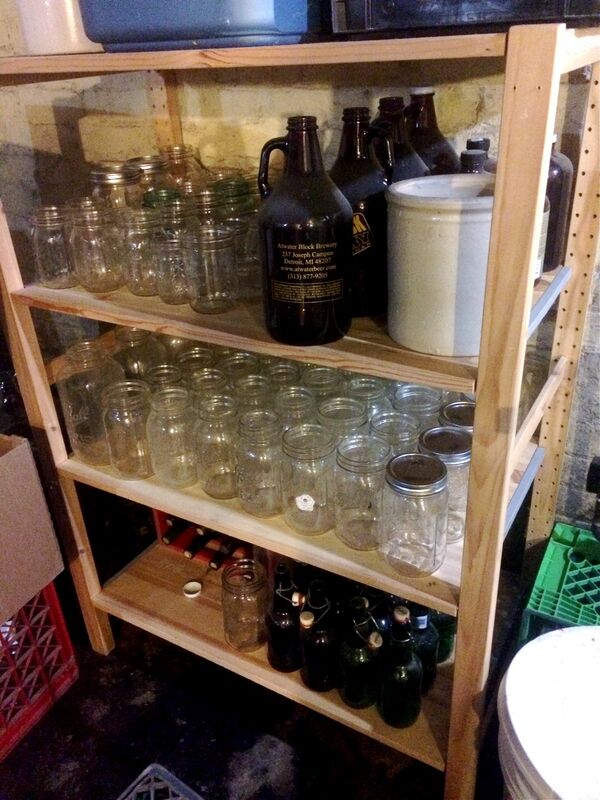 fall project is to put in shelving, as we have very few cabinets, but for now it is lovely to work in. eventually we wish to do a full overhaul of the kitchen, but that will have to wait until money situation takes a change for the better. 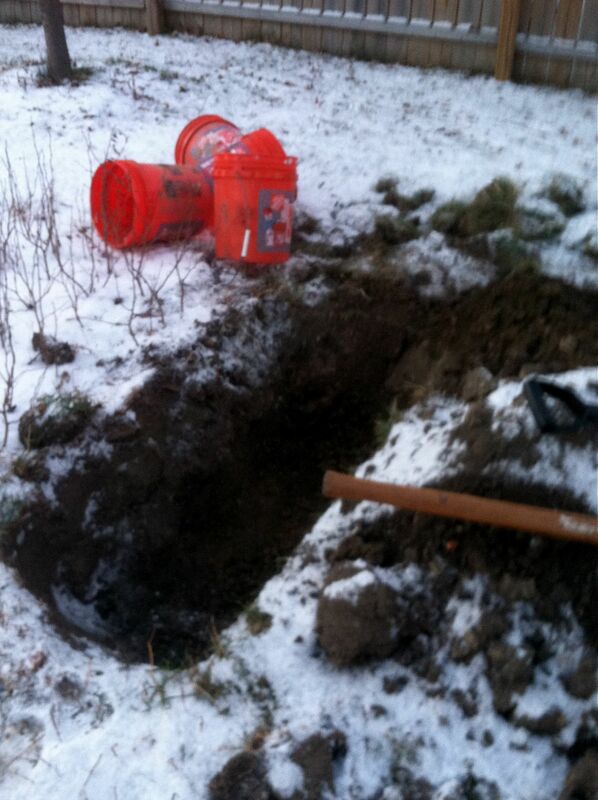 next i write about all the outdoor work. in the fall of 2013 with the ground frozen, i chipped away at the frozen ground in order to be able to plant chestnut seeds for all ya’ll. they have been growing for over a full year, and now are ready for you. i’m taking orders now. these are chestnuts grown from seed collected from mark shepard’s breeding projects at new forest farm, and have been breed to bear well in the cold winters of the north. they are eight dollars each, for those looking for orders of ten or more – i may be able to provide discounts. also please note that these need to be in pairs for proper pollination. i have a limited number of four year old hazel nuts available for ten dollars each and a very limited number of five year old paw paws for 20 dollars each. send an email to mpatrickcrouch at gmail dot com to place orders. thanks. y’all may remember this post from some time ago – when i wrote about this “rat resistant compost” method. there was some skepticism amongst readers. rightly so, considering what i have seen rats do to a trash can, but i was willing to give it a try. 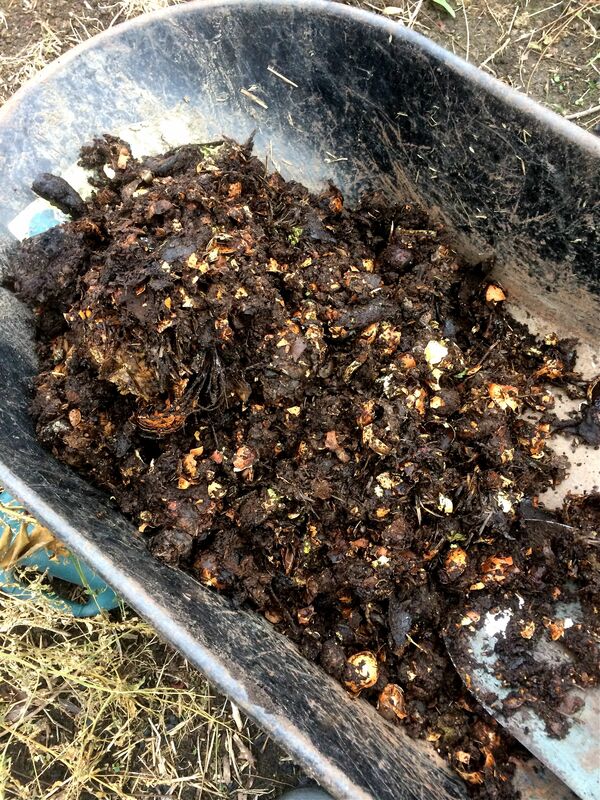 after eight months of adding my kitchen scarps to this pit composting system i dug them up, and this is what i found. not fully finished compost – but something that could be added to worm bins – or in my case my regular compost pile without fear that rats would be interested. no rats gnawed though the bin, so i would call it a success. i’m still looking at methods that are much faster than this for helping out with initial composting in urban areas. if you have any recommendations, let me know. our hoop house is little – at least when compared to what i’m used to. i’ve mostly worked in houses that are 24-34 feet wide and 96 long. our little 14 x 36 foot might be smaller – but it never feels cramped, due to the six foot ground post (and that i don’t have to share it with anyone but my family). one major difference of working in this this house and the others i worked in, it’s ours. no more improving soil for someone else – no more having to make decisions via consensus to decide planting dates – s and i just sit around the table and decide what to plant. like most folks, getting tomatoes early is a big goal, but i’m not that into bragging about who has the earliest tomato, but i do like a good tomato (alright i do like to brag a bit, but it’s not the only reason for wanting early tomatoes). how the early tomato has entered the american psyche as the source for garden bragging i don’t really understand. peas, spinach or even radishes are just as exciting to me. xtra large pumpkins seem like the only other crop that comes close, and i don’t care at all about those – you either carve it or make soup out of it, otherwise the pumpkin has no point. an early tomato you can eat, and that certainly seems worth bragging about. because of the hoop house at work i have likely enjoyed fresh tomatoes much earlier than most detroiters. with my own hoop house i can experiment with early tomatoes in a way i don’t feel at liberty at the farm. so this year we are trying much larger tomato transplants. i’m skeptical, my personal experience is that older take longer to bounce back from transplanting, but that’s out in the field. 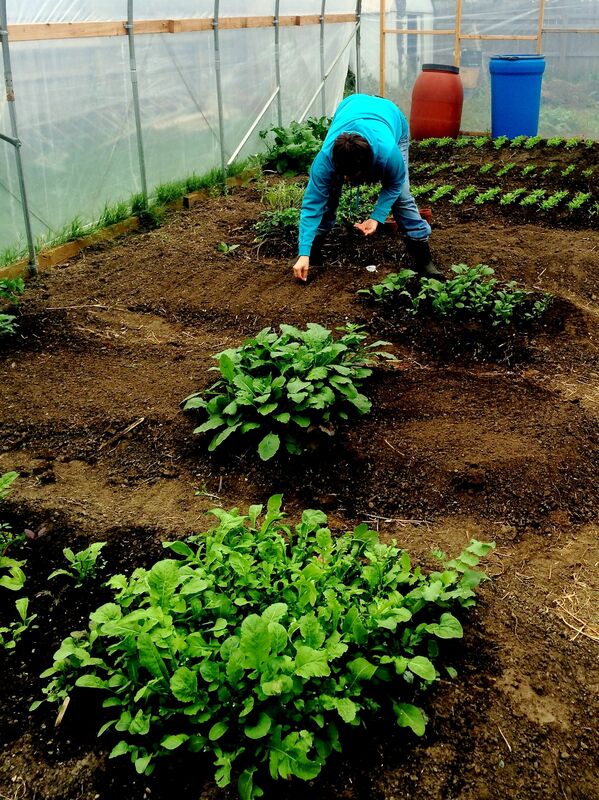 in the hoop house they have less wind, more water and more shelter from cold. perhaps they will do better. is it really about earlier tomatoes? i think it’s ultimately about starting tomatoes earlier. 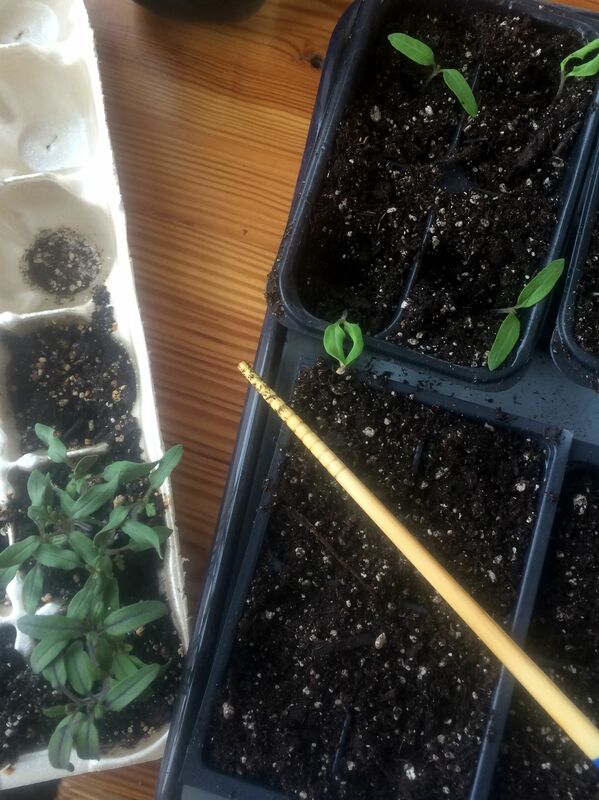 nothing, nothing really gets me though the last of winter like starting seedlings. 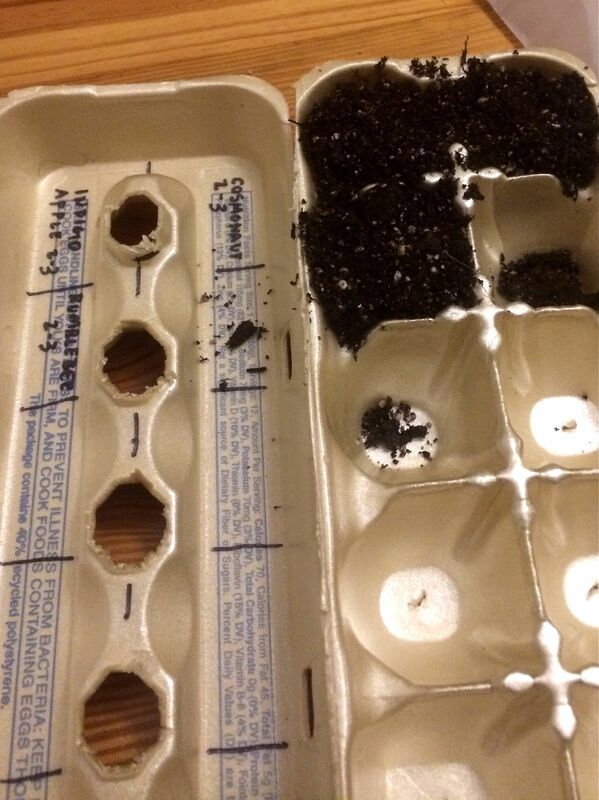 there are so many possibilities for containers to start containers, but for several years now at home, i have settled on the not so high tech styrofoam egg carton. it’s cheap, common, holds in heat well, and is shallow so heat from a heat mat penetrates easily. i cut the top from the bottom and use the top as a tray to go underneath it, poke a hole in each of the egg holders, fill it soilless mix and yr good to go. in order to label – i simple use an industrial waterproof marker to write on the tray of the egg carton underneath each of the egg holders. it works better than little sticks. 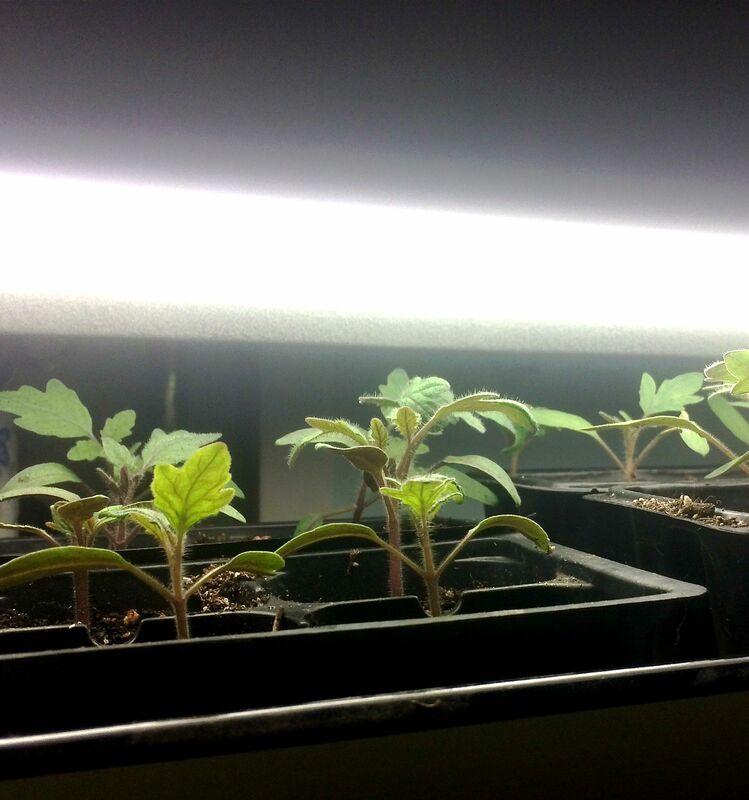 they go on a heat mat and a couple weeks later once they sprout they get pricked out and then go under lights. if i have room i try to keep them on the heat mat as long as possible, but eventually they get kicked off to make room for the next crop. i’m growing these for twelve weeks, which is why i started them so early. 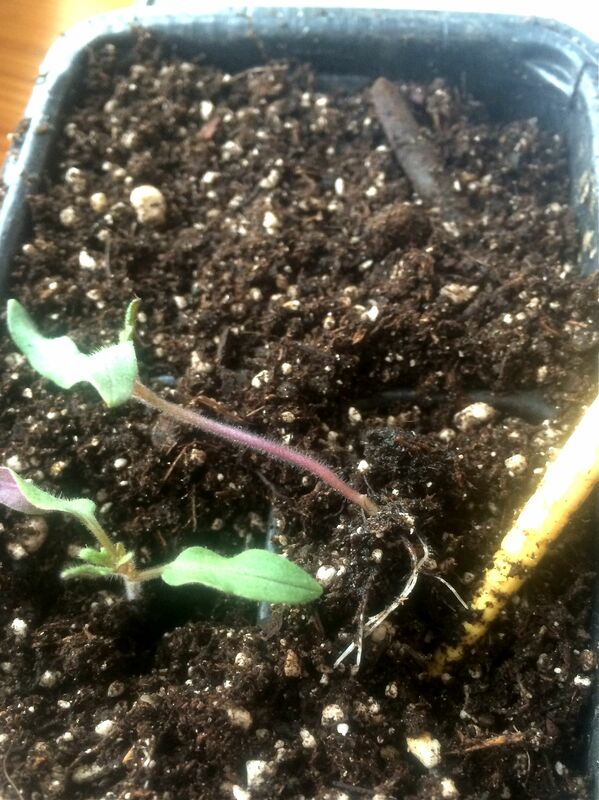 normally i go for a eight week transplant – but as stated before, i’m trying large transplants. the peppers for the hoop house are also started – and i’ve direct sown, peas, carrots, beets, radishes, arugula, scallions, and spinach. what grows in your winter garden? i’ve been reading more about about grafting of tomatoes anyone with thoughts about that? i haven’t written anything since november. and yet i welcome several new subscribers – surprising given the infrequency. welcome new subscribers – i hope you enjoy and will provide feedback. it’s not because nothing has been happening, quite the contrary. we have been going full steam for the last few months – and it’s only this last weekend that we reached a point at which we could take anything resembling a break. considering that s threw her back out and have been having to do child care and adult care for the last day or so it’s not really much of a break. we have been steady working on this house and the yard since we bought the house, but have really stepped up our efforts once we learned that our son had elevated lead levels. nothing drastic, but cause for alarm. things appear to be under control now, but we have had to take major measures to get them under control. i’ll likely write more about lead, testing, and dealing with it, later, but in the meantime i’m just gonna update ya’ll on what projects we have done in order to get lead under control. first was the stripping of paint in areas where encapsulation wouldn’t work. namely the threshold of the front door. 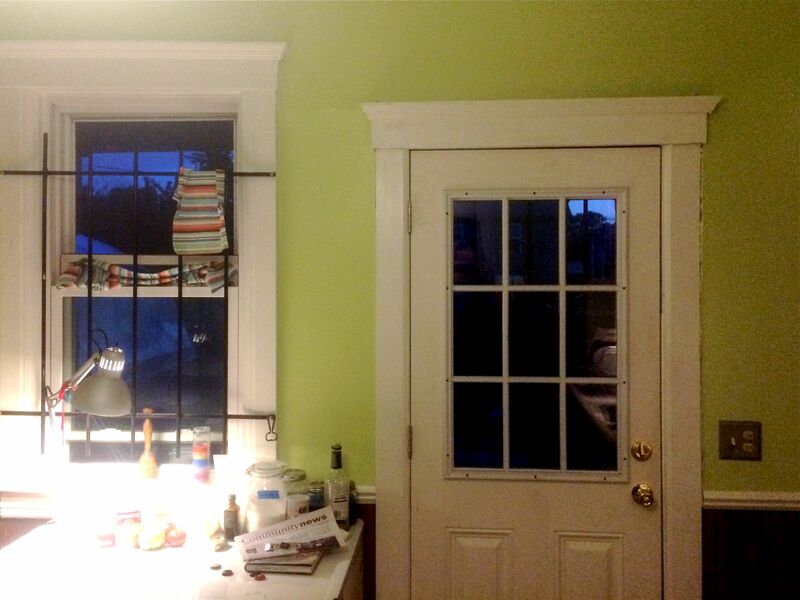 next was encapsulation – woodwork in the pantry and kitchen had to be encapsulated and then painted to match the other woodwork. 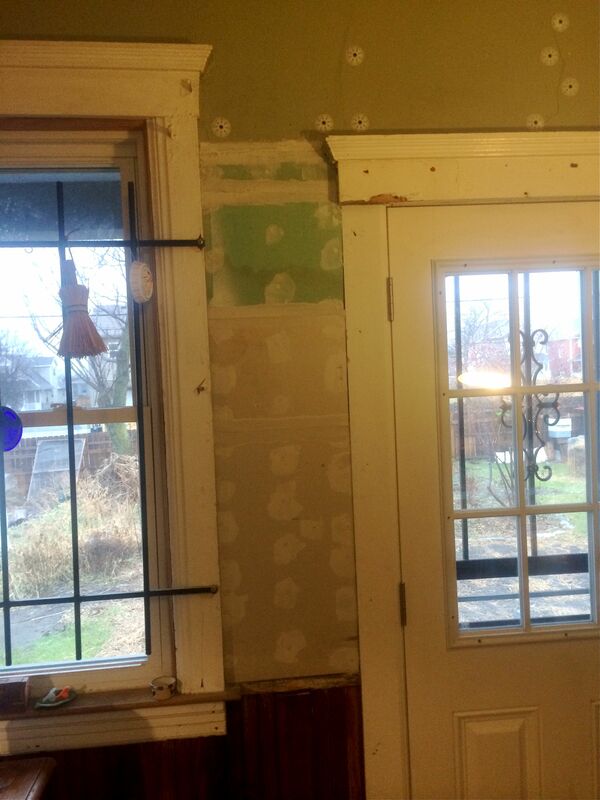 i also encapsulated a couple of walls in the pantry. they still haven’t been painted yet as i still have some plaster work to do on other walls before we paint the whole pantry. the hallway leading down to the basement needed to be encapsulated as well, and then painted. 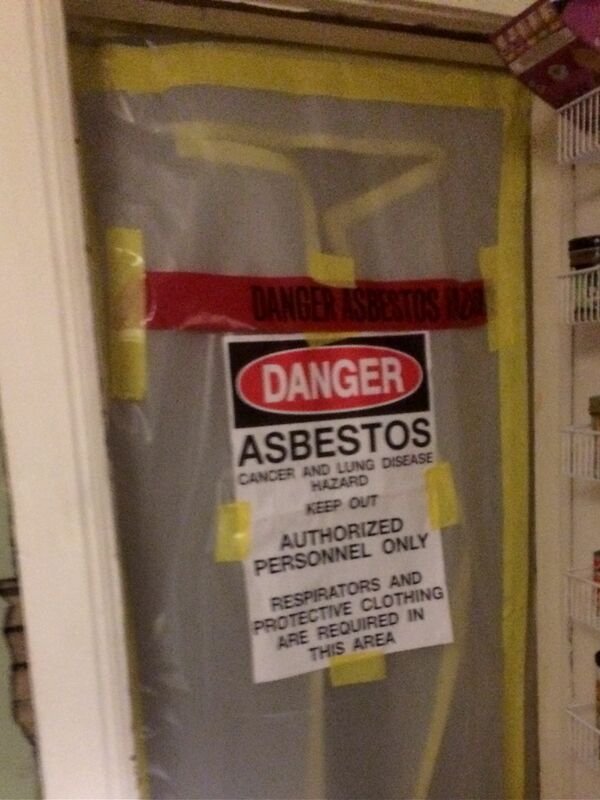 speaking of the basement, as though lead weren’t an issue enough we found out that we had fraying asbestos tile on the floor of the basement. we paid some one certified to remove it. my lungs just seemed worth the cost. what i didn’t think about was all the glue aka mastic that would be left over. it was a huge pain to get off – taking me weeks of weekends and nights to get it up. i’m thankful to the following podcast for getting me though it: serial, 99% invisible, radiolab, snap judgement, the champs, and invisibilia. at least as much time has been spent moving things around the basement, as we had to clear everything out when they removed the tile, and then we had to move it to remove the mastic. i think that’s what made s throw out her back. we are now putting the basement back together, and i’m really happy with the way it’s turning out. it’s making more sense and taking into account how we need to access and use the space. my favorite part is that we have moved the chest freezer and canning supplies closer to the stairs so when cooking you can quickly pop down to the basement and grab some items out of the larder. in addition to encapsulation and stripping, another strategy for dealing with the lead has been removal. 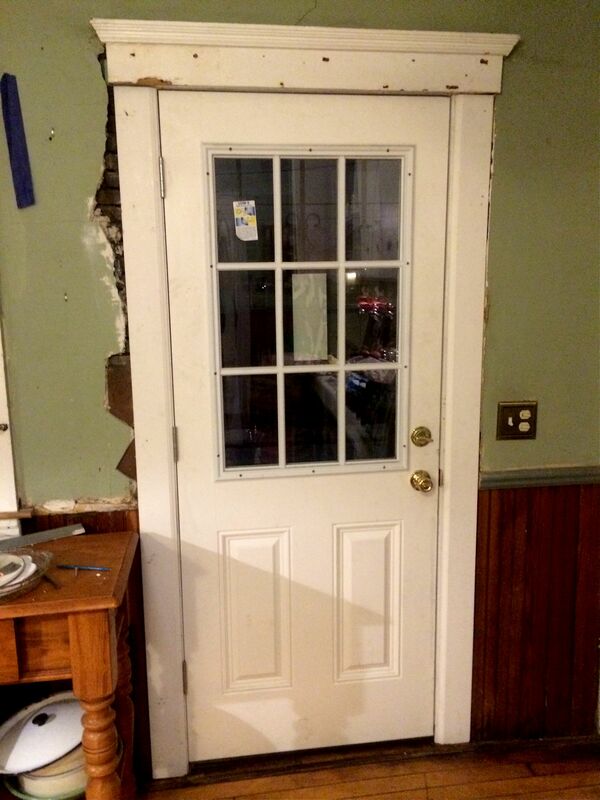 the back door casing was covered in chipping lead paint, and the door was super drafty so we replaced it. i could have replaced it myself – but i knew it was going to be serious pain – and i had plenty of other projects to work on, so i also paid someone certified to do that as well. he told me it would take him a morning. as expected – it was a bigger pain than expected – it took him until 6 at night. no more draft! i still need to replace the molding – and since the original was cover in lead paint i bought new stuff – but couldn’t find anything that would match the original, but i think it still looks ok.
in the process of replacing the door and molding, we damaged some plaster and realized that much of it was pulling away for the lath. we wanted to save as much as we could, but some was just to far gone to repair. 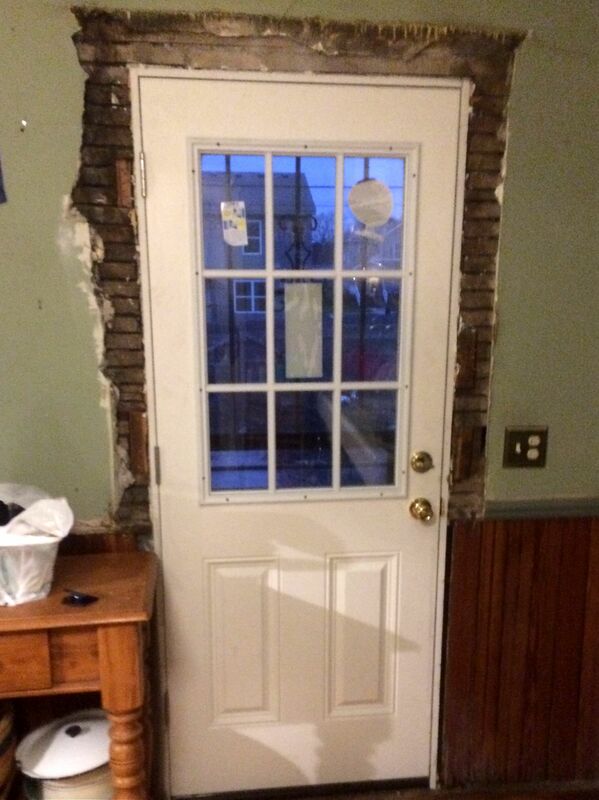 s and i spent new years eve watching youtube videos on plaster repair and new years day doing plaster repair – we know how to party. we were really impressed with the ease of use of big wally’s plaster magic – as well as the youtube videos they have to learn how to use the product. 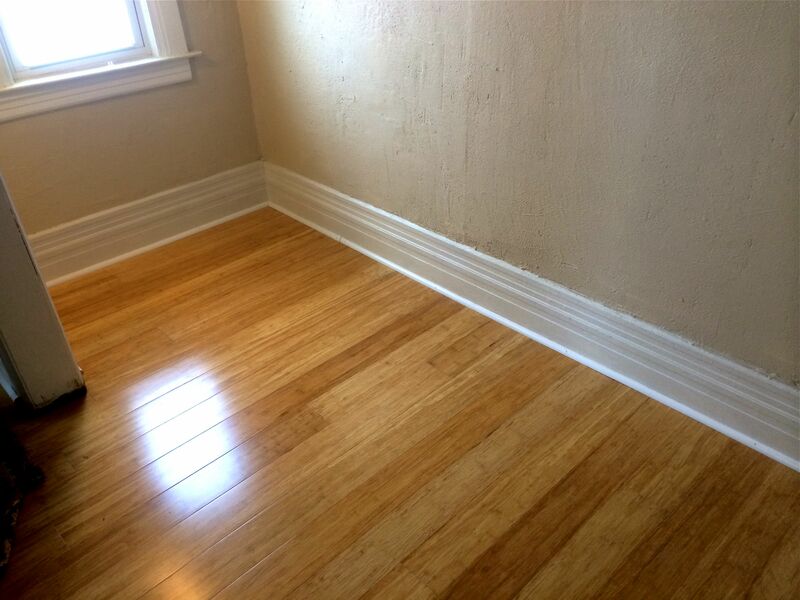 the other major repair project was to put a floating floor down in one of the bedrooms. it had been painted with lead paint on the floor, and rather than try and remove the paint, we decide the simplest thing would be put a new floating floor over top of it. i’m impressed with how quickly it went together. one long day plus a couple hours the next day and we were done, and s is very happy with the result. super big thanks to my brother in law david for his help. at the farm, the biggest event of the fall for me was starting mushrooms. i’ve been missing growing mushrooms since i left the farm i trained at over 12 years ago. i’ve tried to convince folks a number of times to take on the task of growing mushrooms – but it’s never really caught on. 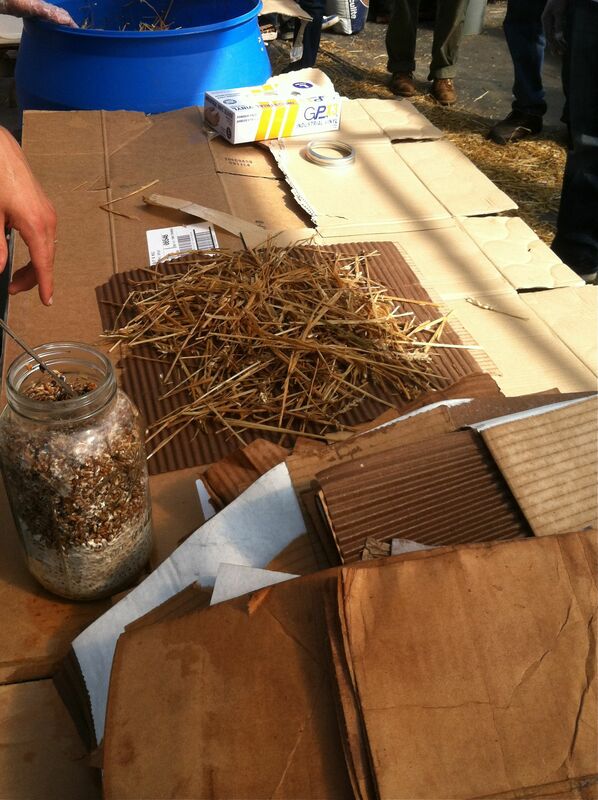 this fall we had a crew from radical mycology come out and lead a beginners workshop on mushroom growing. 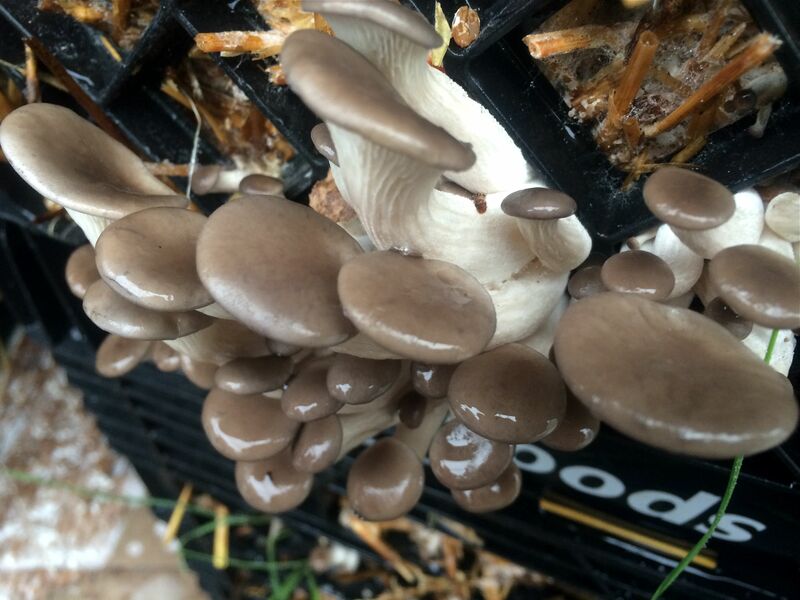 we caught the bug pretty hard and harvested all fall and will be starting up a crop of oyster mushrooms again in the spring. 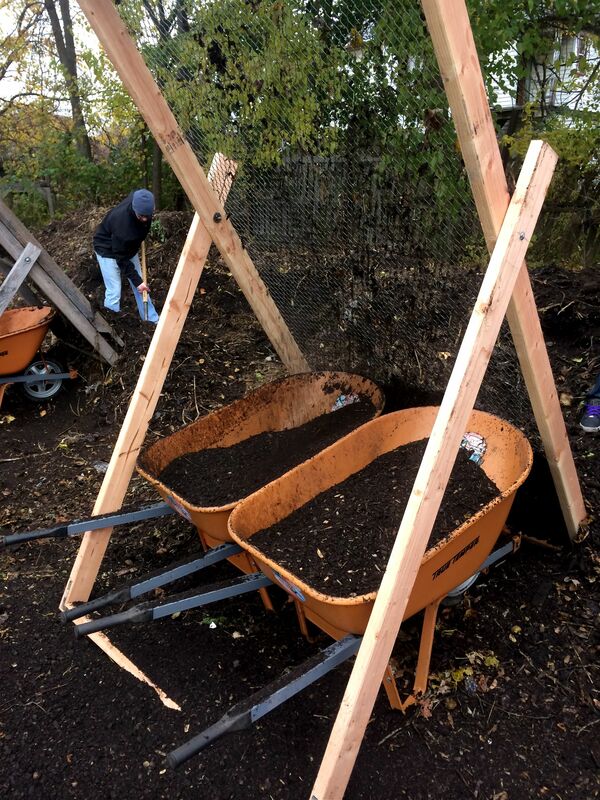 a bit simpler – but equally exciting to those of us obsessed with cycling nutrients – we built new compost sifters. 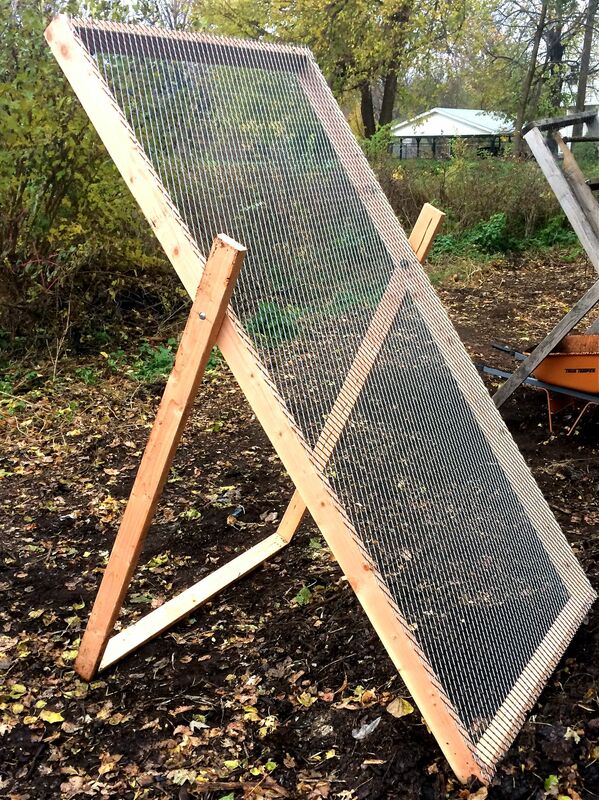 this is the third iteration of sifters we have been working on – and the big improvement is using slit steel rather than chicken wire. the steel comes from one of my favorite places in detroit: federal pipe and steel. this place is a museum of a hardware store, full of oddball items i can’t find anywhere else. the staff know just about everything – though they don’t really let on unless you ask. and the cashiers all seem to be punx. if you visit you shouldn’t miss out on marcus burger. it’s the real detroit deal. this new sifter can accommodate two, count em, two wheelbarrows at once. 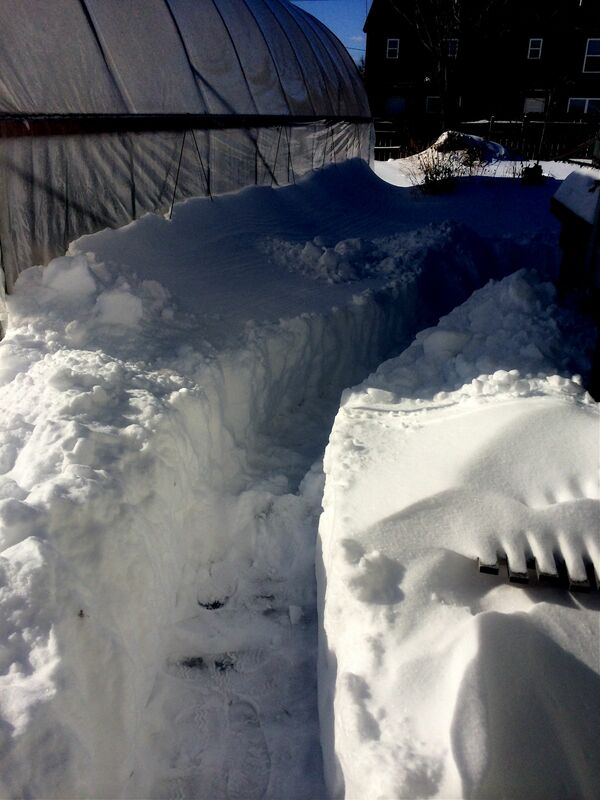 i think the slit steel will last a lot longer than the chicken wire – but only time will tell. i’m happy with them. on the homegrown front, we have been eating out of the hoop house all winter- at first mostly arugula, but for the last month only spinach and kale. the big lesson is to plant more kale next fall. i love having it, but it grows really slow in the winter. spinach continues to be the workhorse of the winter hoop house – cold, dry, doesn’t seem to faze it, we have had great harvests all winter. i was hoping for a milder winter, and the temps have been slightly warmer, and snow a little lighter, but we still have been dumped on, almost 20 inches last week alone. still we prepare for the growing season. 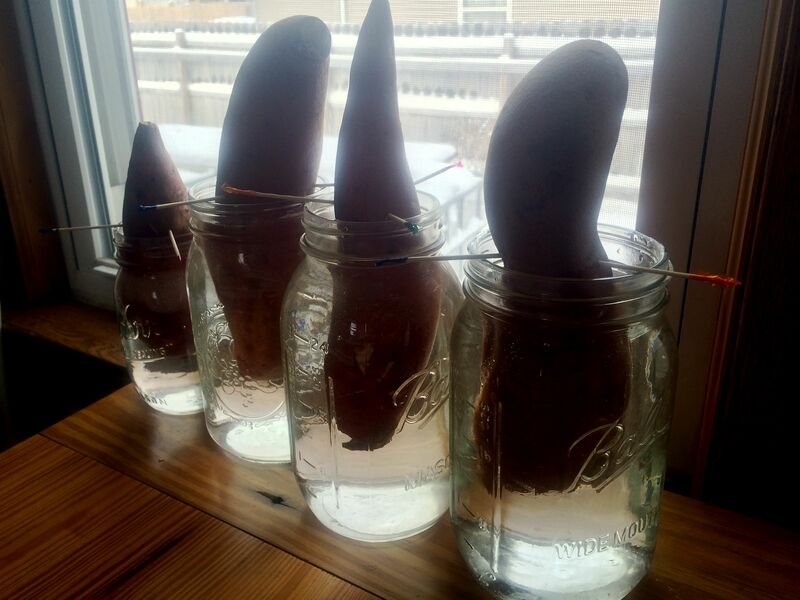 we have already started tomatoes (perhaps a post about them soon) and sweet potatoes are started on the window sill. likely way too early, but we all have our methods of trying to stave off cabin fever, mine is starting plants for the next season. 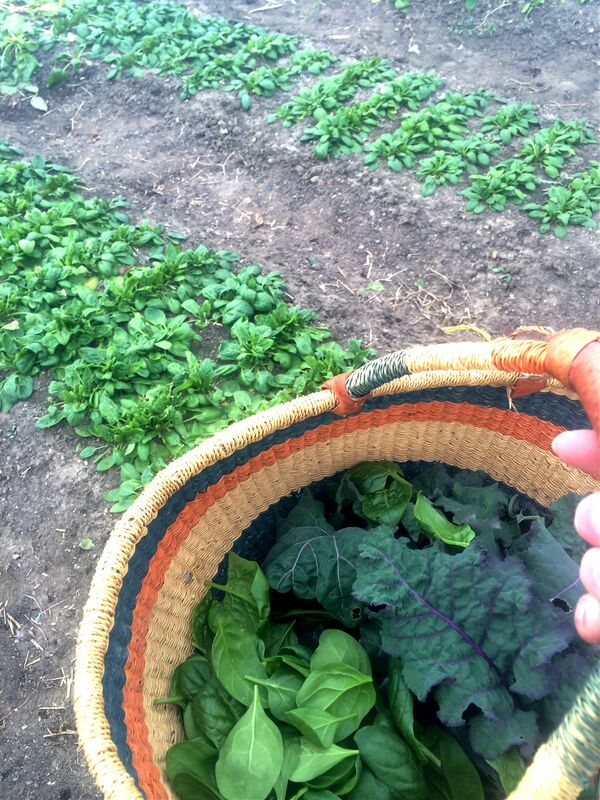 we have been eating out of the hoop house for at least a month – mostly arugula, swiss chard and mustard greens for salad. rather than purchase new seeds i just sowed heavily what old seed we had. i had pretty poor results, and plenty of spots were left blank. 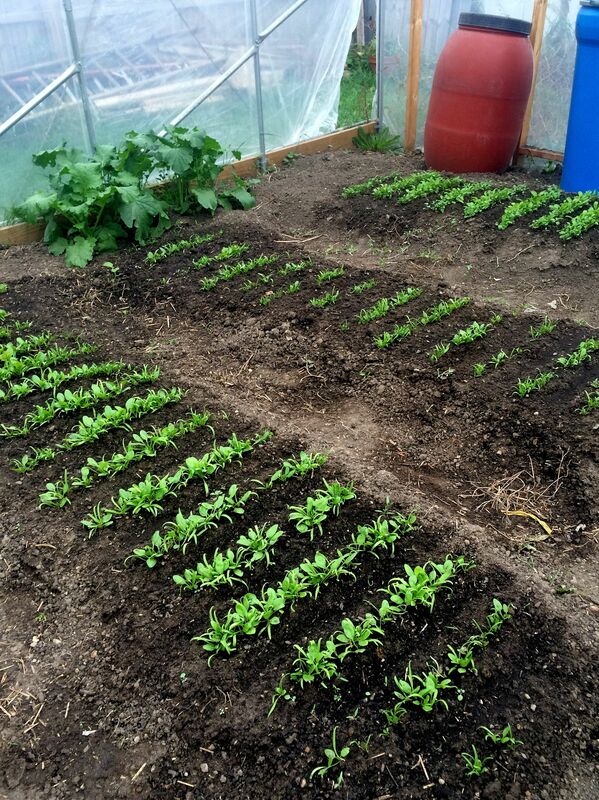 later i went and bought some new seed and seeded two beds in spinach and one in arugula. this photo was taken a few weeks ago – and these plantings are actually further along now, i’m expecting that they will be ready to harvest in a couple more weeks – and since it’s more spinach and arugula than we can eat i’m planning on selling a little to help offset the cost of building the hoop. we also planted a mid october planting in those blank spaces left over from the poorly germinating seed- which should be ready quite late if at all this year – it may be the first harvest of next year.